East Coast Indoor Modelers - Lakehurst! Long a collector's item, Building & Flying Indoor Model Airplanes was printed for the third time in 2008. First published in 1981 and reprinted in 1984, this book has inspired future champions and model builders around the world. Over 200 drawings, including plans and numerous photographs showing the hobby as it is practiced, lure the reader into this fascinating and surprising pursuit. The price is $24.95 plus shipping and handling. 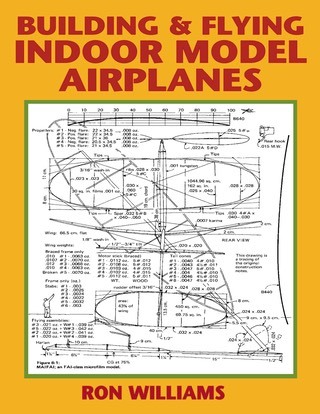 Building & Flying Indoor Model Airplanes (ISBN 978-0-615-20203-7) is available from The Smithsonian Institution Shop at Cooper Hewitt, the National Free Flight Society and Sams Models in England. See the links in the sidebar for more information. Copies personally inscribed by the author are available. You can read more about this book on our Press Release, at Google Books, Amazon.com, or on the websites of the Marin Aero Club and rcgroups.com. Copyright ©2008 Ron Williams All Rights Reserved.